O God, who decreed that Saint Barnabas, a man filled with faith and the Holy Spirit, should be set apart to convert the nations, grant that the Gospel of Christ, which he strenuously preached, may be faithfully proclaimed by word and by deed. Through our Lord Jesus Christ, your Son, who lives and reigns with you in the unity of the Holy Spirit, one God, for ever and ever. St. Barnabas, designated by the Holy Spirit to share the charge and mission of the twelve Apostles, is venerated by the Church as one of them. He played an important part in the first extension of Christianity outside the Jewish world. It was Barnabas who presented St. Paul to the other Apostles when, after his long retreat in Arabia, he came to Jerusalem for the first time after his conversion to submit for Peter's approval the mission to the Gentiles entrusted to him by the Master Himself. Barnabas was Paul's companion and helper on his first missionary journey and returned with him to Jerusalem, but left him when he set out on his second journey and went to Cyprus. 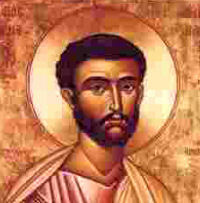 The name of St. Barnabas is mentioned in the Canon of the Mass.